The powerful truck for demanding transport operations – capable of loads of up to 325 tonnes. The heavy equipment transporter that’s made for the most demanding loads. Equipped with the I-Shift gearbox with crawler gears, the Volvo HET offers excellent manoeuvrability and extreme startability in difficult terrain. For when your operation demands real power. Equipped to deliver power and torque when moving heavy military equipment. The D16 engine can deliver up to 750 hp (552 KW) and up to 3,550 Nm and take GCWs of up to 325 tonnes. Many trucks can handle big, heavy loads. But when you need to transport a tank through challenging terrain with the maximum safety, efficiency and speed, you need the Volvo FH HET. The Volvo FH series features inline, six cylinder, four stroke diesel engines fitted with turbocharger and intercooler. They’re also fitted with overhead camshafts and four valves per cylinder. These engines are built to deliver peak power and torque at low revs. Volvo’s patented engine brakes – VEB and VEB+ – can absorb between 375 kW (510) and 425 kW (578 hp). As a result, wear and tear on brake pads and linings is reduced – giving a boost to driver safety and extending the service interval. The new crawler ratios available on the I-Shift makes it possible to transport really heavy loads and get moving in difficult terrain. The I-Shift with crawler gears is a further development of the I-Shift automated transmission, specially developed for excellent starting traction and extreme manoeuvrability at low speeds: namely, everything that’s important for a Heavy Equipment Transporter. The Volvo FH HET equipped with the I-Shift and crawler gears provides starting traction unlike anything else on the market and can take off from standstill while pulling a gross combination weight GCW of 325 tonnes. 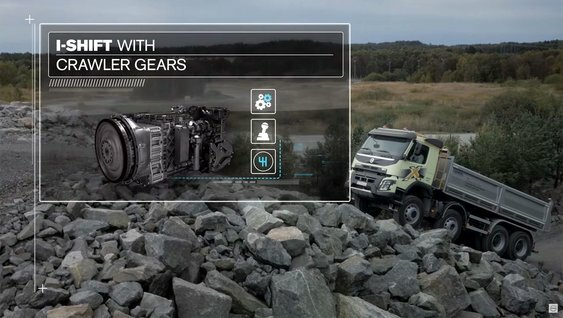 I-Shift Dual Clutch: Constant power flow without torque interruption. Smooth dynamic acceleration. Fantastic for slippery conditions and treacherous terrain. I-Shift: Twelve-speed splitter and range gearbox with automatic shifting. The tried and tested Volvo gearbox is extremely user-friendly, capable of changing gear more efficiently than even the most accomplished driver. This helps keep the gearbox in good working order and minimizes repair costs. Powertronic: A fully automatic power shift transmission with torque converter and oil cooler. Changes gear without losing any power. Manual: 14 speed splitter and range models. Patented synchromesh with servo leads to low shifting forces. And the design of the cable operation means short, distinct gear settings. Adapting the vehicle to your specific requirements by for example adding toolboxes, special 5th wheel solutions for very heavy transports or winches is made easy throughout the whole Volvo FH HET range, through chassis features and an immense selection of specification options. Everything is prepared in the factory – making sure that our strict quality standards are kept. The cabs are comfortable, meaning a distraction-free and non-tiring work environment for drivers. Visibility is superb, making it safe, there’s room to move, instruments are all within easy reach, and there’s tons of storage space for equipment and supplies. Cabs are also equipped with beds and comfort features like parking coolers for longer missions. The Volvo FH is built for transporting heavy loads across challenging environments. So the chassis is built tough, and built to last. Our air suspension system is specifically designed for trucks that operate on rough terrain. It’s available in 4×2, 6×4, 6×6, 8×4 and 8×6 configurations. A hydraulically driven front axle is also available, as are hardwearing tridem axles and Automatic Traction Control. All vital parts – like the braking system and the stabiliser bars – are placed high, giving great ground clearance. The truck can handle obstacles with a significantly reduced risk of damage. Heavy-duty bumpers come as an option on the Volvo FH series – making the vehicles suitable for genuinely challenging missions in unforgiving conditions. The two corner parts and skid plate are made of steel with a thickness of 3 mm. In the event of a collision, the impact is distributed towards the sides, reducing the risk of damage to the components behind, such as the cooler. A better approach angle improves manoeuvrability during off-road driving, while sturdy steel design withstands rough treatment. On X-High bumpers, you can add a heavy-duty front step, flexible in three directions and highly durable. A 3 mm skid plate provides extra security for all vital engine parts. It enables the vehicle to be taken off-road and driven with confidence, even in reverse, and reduces the amount of dust from the ground that gets into the engine’s machinery, thereby reducing service requirements. Equipment – pumps, winches, or other tools – can be added to a unique 400 mm front-frame extension – easily, and as your operation demands. A front towing member is included as standard on every truck. Preparation and quality control goes a long way in the field. We use top-notch Swedish steel in the FH series frames, phosphate coated and powder painted. All of the painting is done prior to assembly – ensuring total coverage and no hidden rust traps. The chassis is maintenance-free, with no forgotten grease fittings. The reason for this? Outside of creating something that we’re proud to say is of real Volvo quality, it means low life-cycle costs for the owner and a lastingly efficient vehicle. Of course, both tractor and rigid variations of the FH-HET are available. Stability at high speed. Control at low speed. All without having to wrestle the wheel. Dynamic Steering provides this – following the driver’s intentions and behaviour for a smoother behind-the-wheel experience. The driver doesn’t need to compensate for bumps from rough road and off-road surfaces. Manoeuvring the truck at low speeds becomes easier, and control and precision are added while driving and reversing. The result? Increases in comfort and efficiency, and reduced driver fatigue. Dynamic Steering is available for all axle configurations. Our focus on comfort is about more than providing a good working environment for drivers. Windows that provide great visibility increase safety. 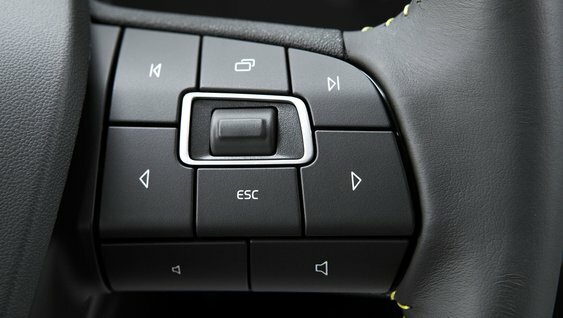 Instruments, buttons and controls that are all within easy reach on the dash can help to reduce distractions and sharpen focus. Easy driving is effective driving. Cab heights of up to 220 cm mean room for passengers, equipment and supplies for longer missions. Seats can be adjusted fore-aft 24 cm, vertically 10 cm. 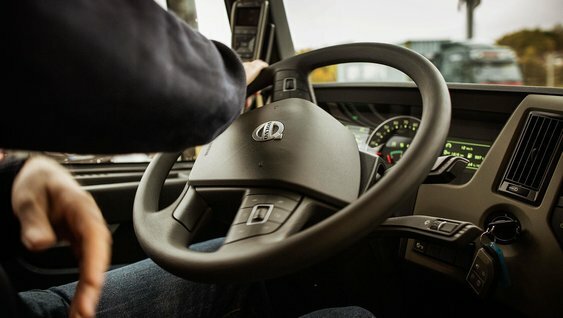 The steering wheel tilts up to 20 degrees and can be folded away while embarking and disembarking, while close controls mean that drivers can keep both hands on the wheel for longer. And there’s storage room for everything that long and demanding missions require.